The mere attempt at delving into the tragedy of Hurricane Katrina is one that is to be respected and is worthy of my attention. It’s surprising that this topic has not been explored previously to Trapped in Katrina, with the exception of documentaries. I especially enjoyed the attention paid to detail, from the difficulty getting back in the city of New Orleans to the passion of the people who lived in the city. So congratulations to Patrick Marrero for the concept of the film and for writing the screenplay. Its films like this that use the vessel of film to expose the masses to things they would never know. I have nothing to say about the acting and the actors in this film. That is a first! I admit to being solely concerned with the progression of the story they were telling. The film was nearing its end by the time I realized I had no complaints with the acting or lack thereof. The casting was excellent and all of the actors were extremely committed and focused on the story at hand. I thoroughly appreciate that. As far as the story goes, I’m not sure how much of it is directly attached to reality, but there were certain touches from the film that lent itself to the feel of a documentary. So from the jump, I naturally accepted everything as the truth. The still images used in the opening credits and the voice-overs from survivors were so real and personal. The set was so unattractive and gritty, I could almost smell the decay of the homes. The fact that they had to be out by the time night fell reminded us that not only did none of the homes have electricity, but the city doesn’t either. The city just isn’t equipped for life in any form. If patrols were really killing people who chose to stay behind for no reason, that is just sad. And now, four years later, the general public has forgotten about those parts. I’m willing to bet those who survived will never forget. There were parts of the film that were problematic. The flashbacks and premonitions got to be confusing. Whatever happened to Amelia? Why was the white guy so crazy? Why was the ending of the movie so abrupt? I would like to think the abruptness of the ending emphasized the title of the film, Trapped. But while I understand the sense of entrapment, I believe the audience is owed an explanation for these things. The ending seemed like a bit of an artistic cop out. The audience invests an hour to two hours watching the film and don’t get the courtesy of closure. That was my only complaint about the film. Otherwise, it was insightful and enlightening. It made me appreciate my life and family. As a Florida native, I know how close we are to being destroyed every season, but somehow our safety is spared. So many other parts of the country are spared this vicious natural disaster. It is always good to come across films like Trapped in Katrina that do more than just make a film because a script was written. Real life was on display. I’m always a fan of that. I received Trapped in Katrina for review from Maverick Entertainment Group. The film is available OnDemand all month on Charter, WOW Internet Cable, MediacCom, Atlantic Broadband, and more. 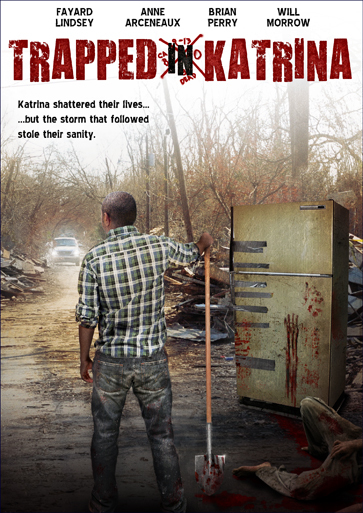 Trapped in Katrina is also available on DVD at Blockbuster, Netflix, Best Buy, and Amazon. This entry was posted on January 7, 2010 by Maverick Entertainment Group in Movie News and tagged Destruction, film, flat tire, French Quarter, hurricane, Hurricane Katrina, Independent film, indie, indy, indy film, Katrina, Maverick, maverick entertainment, murder, New Orleans, Orleans, refrigerator, shovel, urban, water damage. Did you see THE RAVEN with John Cusack?